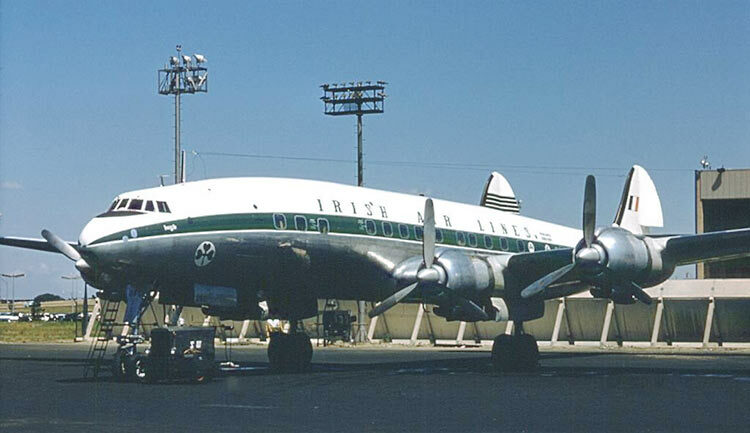 On Saturday, April 26, 1958, a Seaboard Super Constellation landed in Dublin to begin Aer Lingus' trans-Atlantic service two days later. The event was the lead story on the front page of Saturday's Evening Press newspaper. The cockpit crew comprised Capt. Bill Donahue, Relief Capt. 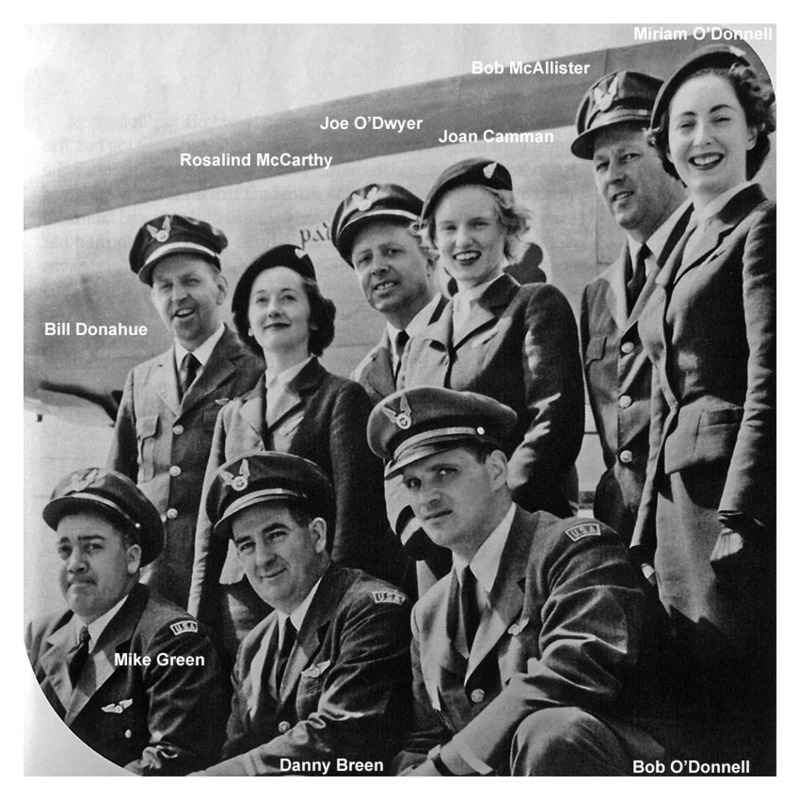 Joe O'Dwyer, F/O Bob McAllister, Flight Engineers Bob O'Donnell and Danny Breen; and Navigator Mike Green. Aer Lingus supplied the flight attendants; Chief Aer Lingus hostess Miss Rosalind McCarthy, Miss Joan Camman, and Miss Miriam O'Donnell. The crew is seen in this photo. As Irish a crew as one could find. The passengers were Robert Wagner, mayor of New York City; a State Department official, general manager of Aer Lingus, other officials, 30 American reporters, and 40 travel agents. After takeoff, Capt. Donahue serenaded the passengers by singing Kevin Barry over the p.a. system. Enroute, the aircraft had an engine failure and made an unscheduled landing at Gander. After discharging the passengers, the aircraft ferried back to New York on three engines. After an engine change, the flight resumed and finally landed in Dublin. Waiting at the airport was a large crowd, including 50 reporters, photographers, and television news people. The inaugural eastbound flight was flown by Capt. Bill Eastwood, and landed in Dublin on May 1. 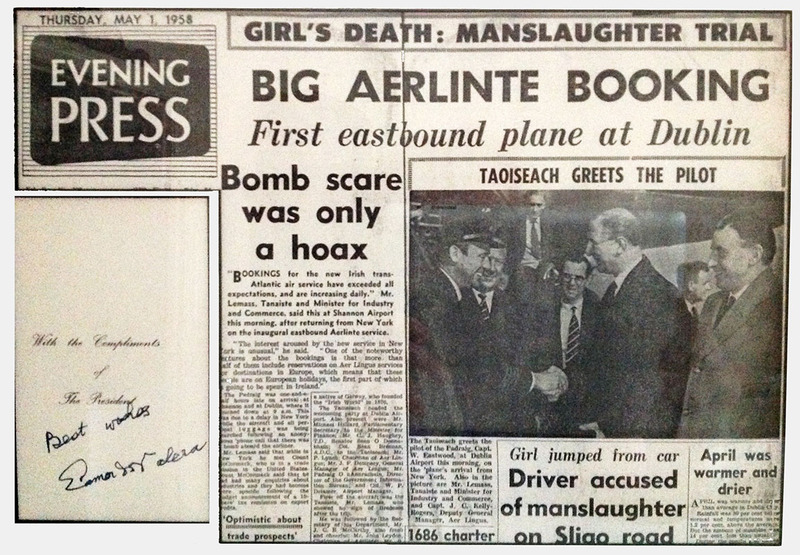 They were greeted by the president of Ireland, Éamon de Valera, seen in this newspaper photo, shaking hands with Capt. Eastwood. The April/May 2008 issue of Cara, the Aer Lingus in-flight magazine, has an article by Pól Ó Conghaile about the flight on its 50th anniversary. Some of the information in the article was provided to the author by Capt. Bill Eastwood. The story about the singing of Kevin Barry is from the article.